Most people are aware of the concept of 'being in the moment' and that if we can live life as it presents itself, we will be happier in general. This translates particularly well into our riding and training philosophy at HHT. When we are working with a horse on any particular day, we treat it as if it was the first day again. This means we have no expectations and no goals. Why should that be an intelligent way to train a horse? It is intelligent because without expectations we can see and feel what is happening that day and not try to superimpose a memory from another session on top. Studies have shown that our memory of an event is not an exact re-run of what happened anyway, they depend on our emotions at the time and our personal perception. Just because that trot felt marvelous at the end of the session last time doesn't mean we can therefore reproduce it this time. We may not have remembered how long it took to get there, or taken into account how we feel today. Every day is a new day with a new potential. But what is wrong with goals? Surely they keep the training on track better and give us motivation? We find that in fact goals have a surprisingly negative effect. They put us under pressure and inevitably the horse takes the brunt of that. Either because they are not able to give us what we demand, or because we begin to sacrifice their real training needs to reach our goals. Expectations and goals are part of an illusion we form in our minds. 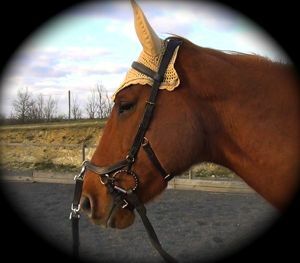 The only reality is what is right here now, in this moment, on this day, between the horse and you. 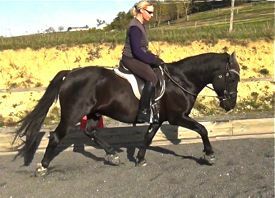 We can never know where the training process with each horse will lead - often it is a winding road - so we just have to keep following what feels right in each moment, right down to what figures and movements we perform in a session. A specific example could be looking at how to make a nice transition: instead of thinking about the actual transition, start by thinking about your own position - are you in balance and straight? Are you relaxed but carrying yourself elegantly? 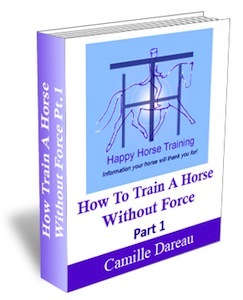 Then use your postural awareness to connect with how your horse is feeling. Is he ready to make this transition, or does he feel a bit slack or a bit tense? Let the idea of making a transition exist only as a possibility without any power in a corner in your mind. Instead focus 100% on your preparation. The majority of this preparation is in your own posture and the rest relies on a rhythmic conversion of expressed energy into contained energy (impulsion) until the transition happens itself, as if by magic. It will also be smooth, straight, balanced and powerful. 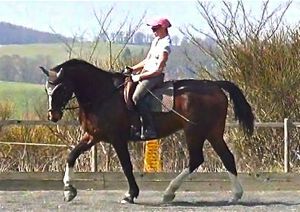 A transition performed in this way is an expression of appreciation for the moment and love for your horse. What it will not be, at most stages of training, is precise. In other words performable at this place, at this time, delivered the instant that you ask for it. That is because the perfect transition takes many years to become precise in that way. If it is performed by demanding riding however (insisting with the leg, spur or whip) then it will never be beautiful because it will always be an expression of greed and fear. Many health issues of horses and people are addressed by reacting to symptoms and because of this the treatment is often intrusive and ultimately destructive. Such treatment often derails and upsets the innate healing power in all of us. It would seem as if 'being in the moment' would be equivalent to reacting to the symptoms as they present themselves. This is true in fact, but the key is how we react to them. True healing is about supporting and appreciating the healing power of the body, and this can only happen if we have faith in it. If we can see beyond our worry and fear about our horse's health, we will be able to be present with their state of being, and this gives us all the answers we need. Including whether we should call a vet, or whether we should act and in which direction. Following the 'present moment journey' has led us at HHT to believe unquestioningly in the innate healing power of our horses. If they can't heal themselves then nothing else will. Last summer one of our mares began to have running, inflamed eyes. Instead of getting the vet out to investigate, every day we simply cleaned her eyes and put organic coconut oil in them. She had a few Craniosacral treatments directly addressing her eyes and also whole body. I was worried about her because eyes going wrong is a fear I have, so I also addressed that anxiety in myself until it resolved. After about two weeks her eyes cleared up completely and she has been fine ever since. It doesn't matter whether it was a little infection or a potentially serious one. She was supported, the fear was resolved and she healed herself. Even this 'result' is not the important thing to take out of it, but rather that we went through an experience based on trust and love.